Welcome Spring with Tofu Quiche!! The Spring Equinox — March 20th — happened while I was in Seattle. So I didn't get a chance to properly celebrate the first day of my favorite season. I had a makeup day last Sunday instead. You see, I HATE, HATE, HATE winter. Hate the cold. Hate the ice. Hate the snow. Hate the grey skies. Hate the dead things and the lack of fresh tomatoes and basil and corn and watermelon. And all that hate makes the coming of spring so much more special. When I start to see the little buds on trees and the first daffodil blossoms, I get so excited. On the first day that I can wear a tee-shirt and my little black flats without socks or a jacket, I'm beside myself with joy. So yea, I'm a pretty happy girl right now! On Saturday, we had what I hope will be our last cold snap. At night, the temperature dropped to 40-something, and I had to pull out my winter coat again! But on Sunday, temps were in the high 60s, and even though it wasn't the first day of spring, it felt like it to me. It was a perfect time to celebrate. And what better way to celebrate the fertility of the earth than with the ultimate fertility food — eggs! Okay, well vegan eggs. I made this Vegan Quiche Lorraine. Since I'm working on my vintage vegan cookbook, I figured this would be a great time to develop a new recipe for this oh-so-1960s recipe. 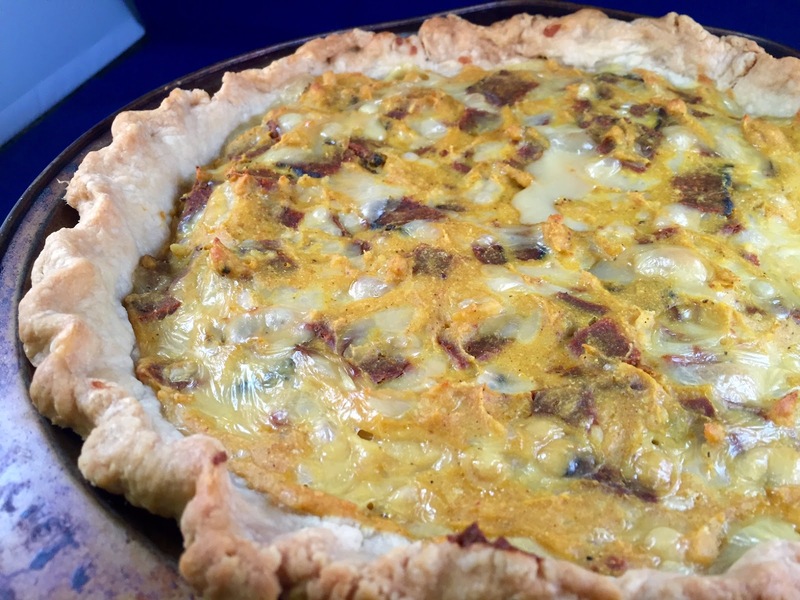 Traditional quiche lorraine is made with bacon and Swiss, and it was a fixture at 1960s dinner parties. Look at this awesome old ad for Robin Hood flour with a quiche lorraine recipe! I'm saving the recipe for my cookbook, but I can give you the basics: I used a silken tofu-chickpea flour base instead of eggs, and I seasoned it with black salt for that eggy flavor. I used Sweet Earth Benevolent Bacon, but any vegan bacon will do (even homemade tempeh bacon!). And instead of vegan Swiss, I used vegan mozzarella. But Daiya vegan Swiss would have been good too. I just figured the recipe would be more accessible with vegan mozzarella since it's more widely available. I enjoyed my quiche with my Sauteed Garlic Kale recipe, also going in the book (1990s chapter). It's a quick saute with kale, garlic, mirin, and soy sauce. 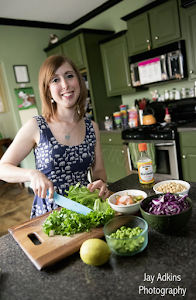 If you've read my last couple posts, you'll know that I recently returned from a fun visit to Seattle, where I did cooking demos and signed books at their VegFest, ate way too much food, and hung out with old vegan buds. I posted about all that yesterday and last Thursday. But tonight, I'm posting about my last day in Seattle and my unfortunate flight home. I was supposed to fly out of Seattle at 2:30 p.m. on Monday, so I woke up in my room and heated up my leftover Vegan Country Fried Steak and Biscuit from Wayward Vegan Cafe. Thankfully, my room was equipped with a microwave and mini-fridge. I had a few hours to kill, so I walked down to the Space Needle, which was just a couple blocks from the hotel. After a short wait in line and a cramped elevator ride, I was at the top! 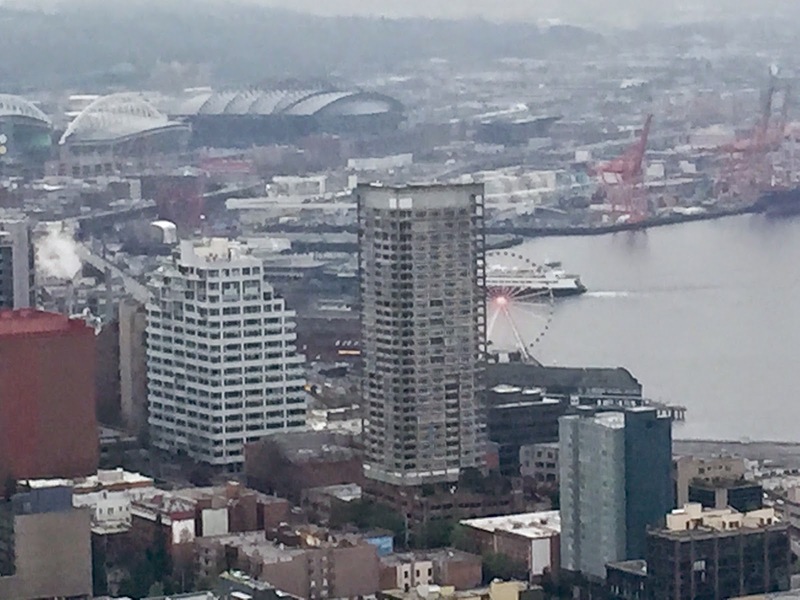 While I was in the Space Needle, Rhiannon (Book Pub Co's marketing guru, who was also flying to Memphis but on an earlier flight) texted me to tell me her connecting flight in Chicago was delayed until 9 p.m. because it was snowing there. I started to panic, thinking my flight might also be canceled. But I checked the Southwest website, and everything seemed a-okay. So I headed to the airport. I didn't really have time for lunch, but I did snack on this Northwest Couscous Salad from a stall at the Sea-Tac Airport. It was really good! Couscous, chickpeas, hazelnuts, celery, apricots, carrots, currants, and lemon dressing. While I munched on this at my gate, an attendant announced that weather issues in Chicago were causing delays. He said our flight from Seattle to Chicago would be delayed by 30 minutes to an hour. Sigh. Well, I waited and finally boarded. The four-hour flight was pretty boring, but I had lots of snacks to keep me busy, including this yummy Vegan Club Sandwich that I'd picked up at the Vegan Haven grocery store the day before — Tofurky, vegan ham, tempeh bacon, vegan mayo, lettuce, and tomato. YUM! When we finally landed, texts started rolling in from Rhiannon. Her delayed flight — the same flight I was supposed to be on — was canceled. And it was the last flight of the night! Several other people from Memphis were on my flight, and we all waited at the customer service desk for instructions. I overheard an attendant telling a Memphis dude in front of me that she didn't have any available Memphis flights until Wednesday afternoon. This was MONDAY NIGHT! Yea, I cried a little bit. And the Southwest man who helped me was super-nice, and somehow, he magically found room for me on a 9 p.m. flight leaving Tuesday night — a full 24-hours after my scheduled flight. But it was the same flight Rhiannon and Phorest had been moved to! Luck! Also luckily, Rhiannon has family in a suburb outside of Chicago. And a scary (and very expensive) cab ride later, I was safe at her aunt and uncle's house, sleeping on a pallet in the floor. They were so nice to let us stay there! It had brown rice, roasted tomatoes, green peas, corn, and all sorts of goodness. It was nice to get some veggies in after going junk food-crazy in Seattle. Across from the Starbucks was a Target (like I said, this was the burbs), so we walked over and got some more food to heat up at her aunt and uncle's house. 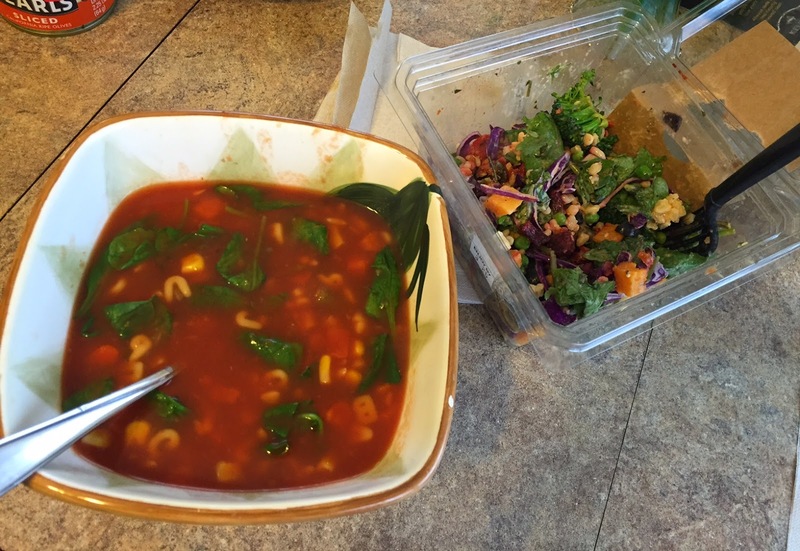 Lunch was cans of Amy's Alphabet Soup and Salad. It would have been nice to check out Chicago while we were in town, but we were quite a ways from downtown. And we didn't really need to spend more money on cab/ridesharing fare. So we visited with Rhiannon's family until it was time for her uncle to drive us to the airport. Once there, we needed booze and dinner. I found some wine and Ma Pao Tofu from King Wah Express in the Midway airport. Not the world's greatest tofu but not bad either. Oh, and the fortune cookie was vegan! That so rarely happens! The flight home from Chicago to Memphis is a short one, just an hour in the air. But we were pooped and so grateful to be heading home. Here's Rhiannon and Phorest on the plane — tired but glad to be almost to Tennessee. Well, we made it back. I don't do well when plans don't go as planned, but I was glad to be with friends through the whole ordeal. And I'm super glad to be home. I don't think I'll be flying again for awhile, especially through Chicago in winter or early spring! My whole reason for going to Seattle last weekend was to do a couple of cooking demos and booksignings at Seattle VegFest. My publisher — Book Publishing Company — sent me and a few other authors. This was my second year demo-ing at Seattle VegFest! 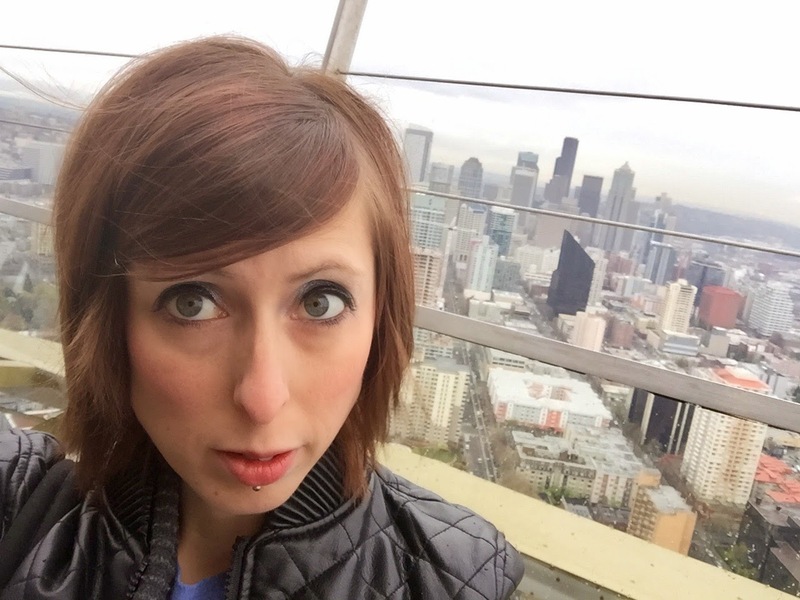 For a recap of what I ate on Friday (the day I arrived in Seattle), see my last post. This will be a recap of what I ate before, during, and after VegFest on Saturday and Sunday. Our hotel, The Inn at Queen Anne, was surrounded by adorable coffee shops, so I tried to hit up a new one each day. Saturday morning started with this Orange Mocha Soy Latte from Caffe Ladro, definitely my favorite latte of the trip! I arrived at VegFest a little early and began prepping for my noon demo. But since I was so early, I had lots of time before the demo to wander around and sample food. My favorite booth was, of course, the Mighty-O Donuts table. They were stocked with mini donuts all weekend. I ate my fair share. Miyoko was there sampling her amazing line of Miyoko's Kitchen aged cashew cheeses! And she did cooking demos and booksignings. Speaking of cheeses, I was mega-impressed with samples from the Vtopian Artisan Cheese booth. They were also serving up nut-based cheeses, but they had crazy awesome flavors, like Mapled Seitan Cheeseball and Caramelized Onion Camembert! I had never heard of Vtopian before, but I'll definitely be ordering some cheeses from their website! Another favorite new (to me) product was Manitoba Harvest's Hemp Pro 70 protein powder! I love my protein powders, and this one — available in Original, Vanilla, and Chocolate — was so creamy and naturally sweet. And it has 20 grams of protein. They gave me a TON of samples to take home! After sampling my way around the fest, I headed back to the cooking stage to demo the Vegan Pimiento Cheese and Butter Bean Bruschetta from Cookin' Crunk. Before I got started, I met blog reader Azure! After my demo, I went straight to the booksigning table. And after I signed a few copies, I noticed someone familiar walking around. It was Heather from Memphis! She just moved to Seattle a few months ago, and I hadn't even heard. So I was super-surprised to see her. Heather used to work at Imagine Vegan Cafe. So Delicious was there handing out free ice cream bars. I enjoyed this Mocha Almond Fudge Bar while signing copies of my book. After the signing, I wandered around and ate more samples. I basically made a lunch out of samples! And I spent the rest of Saturday hanging around BPC's book sales table with Bob (the boss man) and Rhiannon (the marketing guru). BPC also sent Sproutman (a.k.a. Steve Meyerowitz) to VegFest. I didn't get a chance to hear his talk, but I did buy his Kitchen Garden Cookbook because it's filled with recipes using sprouts, including recipes for homemade sprouted grain bread. I'm gonna try it soon! After VegFest ended on Saturday, the BPC crew — Bob, Rhiannon, Phorest, Sproutman, Chat Mingkwan (author of Buddha's Table), and myself — headed to Bob's very favorite Seattle restaurant, Sunlight Cafe. It's a vegetarian restaurant with lots of vegan options, and they're kinda famous for their ridiculously amazing tempeh. 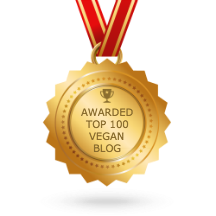 We ate there last year too, and everyone was just blown away by how awesome the tempeh was. Last year, I had it in a sandwich. But this year, I got the Tempeh Tacos with brown rice, black beans, guac, and salsa. You can't see the tempeh here, but trust me, it's there and it's insane. On the side, I had a Salad with Lemon-Tahini Dressing. Love their dressing! And a Scuttlebutt Brewing Company Porter. Love me a good local porter. Later Saturday night, Rhiannon, Phorest, and I wandered around the Lower Queen Anne neighborhood of Seattle (near the hotel) and stopped into a bar called Solo for a glass of wine. And then we hit the hay early to do it all over again on Sunday! 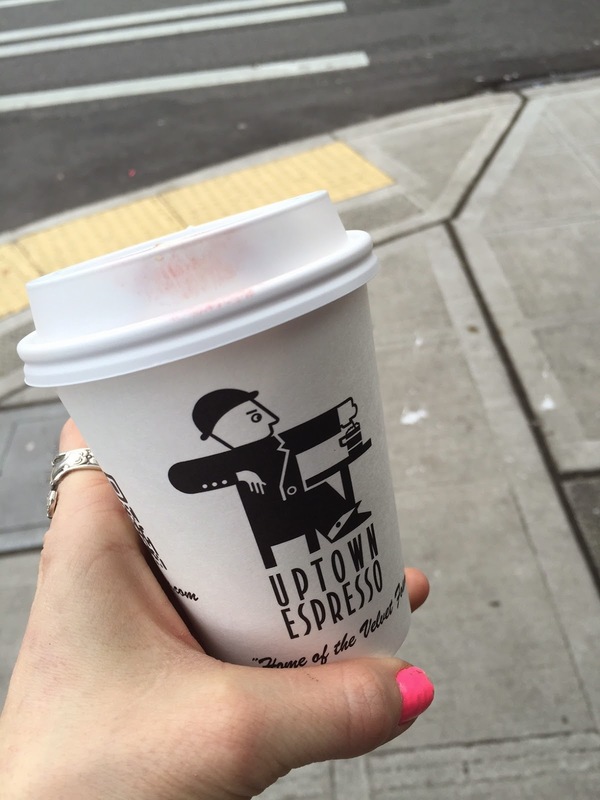 Sunday morning started with a Hazelnut Soy Latte from Uptown Espresso, another coffeehouse near the hotel. This place got bonus points from me for being dog-friendly. There was an adorable giant poodle at the counter with his human. And they have a special foam called "Velvet Foam," which they were able to do with soy. Made for a super-creamy latte. On the walk to the Seattle Center Exhibition Hall, where VegFest was held, I snapped a quick selfie with the Space Needle. Then I headed inside to set up for Sunday's demo — Vegan Deviled Eggy Bites. Here's my table all ready to go! I actually saw Vida Vegan Con organizer Michelle Truty at VegFest on Saturday, but I didn't ask for a picture because Michelle isn't that into being photographed. It was great seeing my Portland VVC pals in Seattle! After signing books for about an hour, I was famished. I knew from last year that Plum Pantry (Plum's Bistro's fast-casual little sister) was located right behind VegFest in the Seattle Center Armory building. So I walked over there for this Buffalo Seitan Salad. Sadly, they were out of croutons, so my salad just had fried seitan, caesar dressing, and buffalo sauce. Still delicious. I was trying so hard to be good and order salad, but then I saw Plum Pantry's desserts. I could not resist this Vegan Cookies & Cream Brownie. It's all about balance, right? After lunch, I headed back to VegFest and spent the day hanging out at the BPC table. After it was over, I hopped in a Lyft car and headed to the University District for some shopping at Vegan Haven, an all-vegan grocery store that donates part of its proceeds to the Pigs Peace Sanctuary. Look what I saw on the cookbook shelf! They had my book for sale! I had dinner plans with my Seattle buds, Dawn and Brit, both of whom I met at the first Vida Vegan Con in Portland in 2011. I make plans with them any time I'm in the area. We settled on dinner at Wayward Vegan Cafe, which has a new classier location with liquor! Sadly, Brit wasn't feeling great and couldn't make it. But Dawn was there! For some reason, I forgot to take a picture with her. But I didn't forget to photograph what I ate at Wayward. Typical food blogger prob — all food pics and not enough people! Anyway, I started with a Vegan Bloody Mary! Wayward's all-vegan menu is huge and filled the kind of comfort food I love. Making a decision on what to order was HARD! But the server suggested the Country Fried Steak Platter — two breaded and fried seitan patties with country gravy, two potato pancakes, and garlic kale. This was freakin' amazing. I had planned to order another meal to take back to the hotel room and heat up for breakfast. But I ended up having about half this platter left. So I just got one of Wayward's fluffy herbed biscuits (with a side of jam!) to go. The next morning, I stuffed the leftover country fried steak inside the biscuit and topped it with jam for a yummy breakfast sammy. After dinner, Dawn showed me the awesome, very vegan-friendly Central Co-op grocery store by her apartment. I got some Sjaak's Easter chocolates to take home! Whew! Well, that was a massive post. And I still have one more Seattle post to go. I'll be back tomorrow with the last day wrap-up (plus, a bonus day in Chicago). Omg, I am so sorry for the long pause in blogging. I intended to return from Seattle Monday night and get right back to blogging on Tuesday. But Mother Nature had other plans. Snow in Chicago meant my connecting flight to Memphis was cancelled on Monday, and I was stuck for a full 24 hours in Chicago. But it turned out okay. More on that in a later post. I have tons of pics from my Seattle trip and VegFest, so we'll start with day one. I arrived in Seattle, along with Rhiannon (from the Book Publishing Company) and Phorest (her partner, along for the ride), around noon last Friday. Bob, the big boss at BPC, picked us up at the airport. As per tradition on day one of BPC's Seattle trips, we lunched at Bamboo Garden. I ordered Lunch Combo E — General Tso's "Chicken," "Chicken" Fried Rice, "Chicken" Chow Mein, and a Spring Roll. LOVE THIS PLACE! Their mock meats are top notch. I would seriously be in trouble if this place was in Memphis. Oh, and there was also a Corn Chowder served before the big combo meal. It was okay. But the General Tso's Chicken was OFF THE HOOK. Just what I needed after a 5 1/2 hour flight! After lunch, we headed to the Seattle Exhibition Hall to set up the BPC's table for VegFest, which started on Saturday. Okay, well they worked. I lingered around, pretty much doing nothing. And that made me so tired! I woke up at 2:30 a.m. for my 5:50 flight that morning, so I was fading fast. So while they worked, I set out for coffee. There's a little coffeehouse just a block from VegFest called Caffe Zingaro that I frequented lots on my last visit. I stopped in and bought this fantastic Toasted Marshmallow Soy Latte. Don't worry — no real marshmallows, just a flavored syrup. And look at that perfect latte art! Bob invited me to Friday night's big catered VegFest kick-off dinner hosted by the Vegetarians of Washington, the group that puts on VegFest. But I just couldn't do it. I was so tired and so mentally exhausted from taking in everyone's energy on the plane. I needed to recharge. But I did join Bob, Rhiannon, Phorest, and Bob's sister Jane for beers after set-up. We met up at brewpub McMenaminn's for pints of their made-in-house beer. I had the Paeter's Porter. Friday may have been the first day of spring, but that doesn't mean I'll give up my dark beer! After beer time, I retreated to my room to recharge while everyone else headed to the catered dinner. Even though I'm not shy, I am quite the introvert. And being on planes and around people all day zaps my energy — big-time. I just needed a little me time, you know? But I was still hungry. So I googled to find out where the nearest Veggie Grill was! And there was one just a short walk from the hotel! Horray! Man, when I saw those orange lights, my soul lit up! I haven't had Veggie Grill since Portland in 2013. It was so hard to make a decision on what to order. But I narrowed it down by ruling out any dish that was similar to what I can order at Imagine in Memphis. And since both restaurants use Gardein products, they do have very similar menus. That helped. I ended settling on the Harvest Bowl — Field Roast sausage, roasted veggies, quinoa, kale, and miso gravy, Yea, they pretty much had me at miso gravy. Of course, I needed a beer to wash this down. I have a rule about sticking with local beers when I'm traveling. The cashier suggested this Scotch Style Pike Kilt Lifter Ruby Ale from the Seattle-based Pike Brewing Company. It was a nice light, slightly smoky brew that complemented my Harvest Bowl perfectly. After dinner, I walked back to the hotel in the shadow of the iconic Space Needle. I wanted to turn in early since I had a full day planned for VegFest on Saturday. But before I passed out, I watched a little Forensic Files marathon on HLN (my favorite show ever!). It's so exciting to have cable when I'm in a hotel. I don't have cable at home really (just the basics), nor do I have time to watch TV in real life. But when I'm traveling, CABLE! Anyway, I enjoyed my "murder shows," as I like to call them, while sipping on this fantastic Peanut Butter Cup Porter by Tacoma-based Wingman Brewers. DUDE. Best beer ever. I bought another pint to take home with me. I wish I could find this back home because I'm gonna want more. Anyway, that's all for tonight. I'll be back to daily blogging on Sunday, and I'll post pics from VegFest and fill y'all in on my harrowing trip home. Stuff I Ate and a Seattle Send-off! 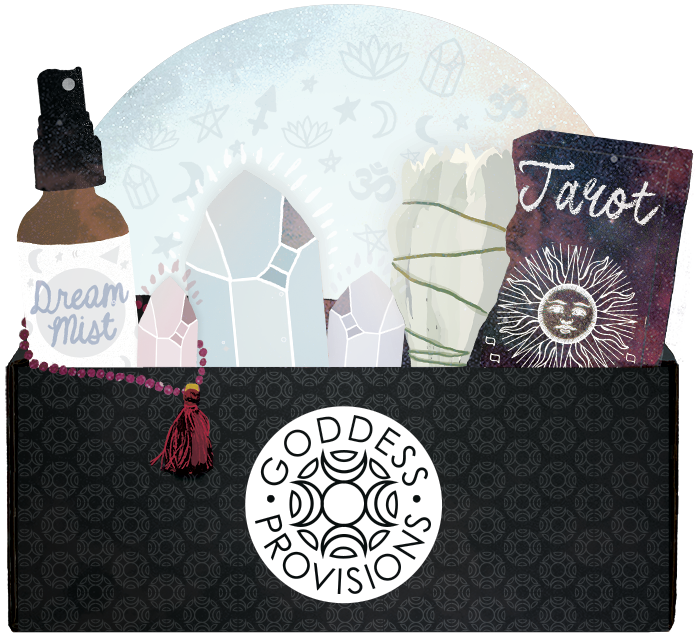 I'm writing this post on Wednesday night, but I'm setting it to go live on Thursday. But as I type, I'm about to go see Die Antwoord at Minglewood Hall!!!!!! I actually saw Ninja and Yolandi just walking around downtown Memphis today. I was listening to Die Antwoord on Pandora in my car at the moment I saw them so it was totally surreal. But anyway, I'm posting a quick "stuff I ate" round-up because I'm heading to Seattle early Friday morning for their VegFest. My publisher was gracious to invite me to go again this year, and I enthusiastically agreed. So if you're in Seattle, come see me at VegFest! 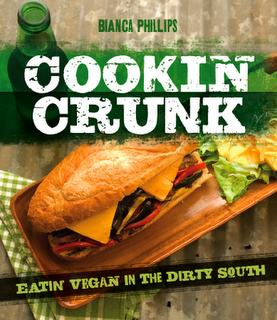 I'll be doing cooking demos and signing copies of Cookin' Crunk, and there are lots of other great vegan cookbook authors lined up too — Miyoko! Chat Mingkwan! Sproutman! Anyway, here's some stuff I ate recently. Let's start with dessert because when I'm eating dessert, I always have it BEFORE my meal. You know, so I don't get too full first. A couple weeks ago, Stephanie made a vegan version of O'Charley's Caramel Pie to sell at Imagine Vegan Cafe. OMG!! A layer of caramel and a layer of whipped topping!! I'm such a fan of anything covered in whipped topping. I think this is my new favorite pie. Last week, Stephanie made Vegan Baklava! This girl is tearin' it up with all the stuff I like. 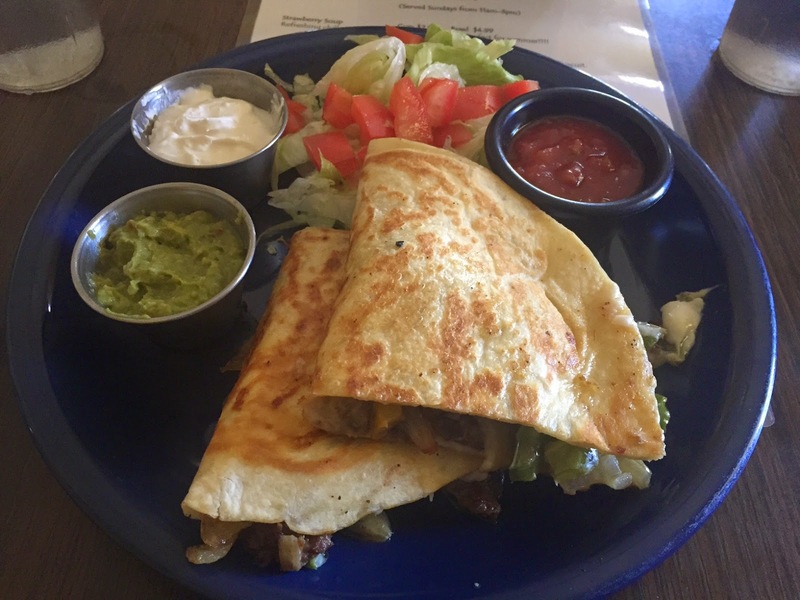 Other meals from Imagine Vegan Cafe — Vegan Steak & Cheese Quesadillas!! This is one of my top five favorite menu items. They use the Gardein Beefless Tips, and they're shredded and fried and squished inside a crispy tortilla with lots of vegan cheese and peppers. And one day, when I was feeling sorta healthyish, I ordered this Vegan Grilled Chicken Salad from Imagine. Also made with Gardein. Lots of vegan ranch on the side. Speaking of healthy, this Vega One Cinnamon Bun Smoothie tastes like dessert, just like a cinnamon roll! But it's loaded with healthy protein, greens, fiber, and maca. Had this after a run one day. I've been eating these Field Roast Apple Maple Breakfast Sausages for breakfasts this week, and they're so amazing. They taste like sausages that have been rolled up in pancakes. Field Roast really does everything right, you know? Sadly, you can't buy these in Memphis right now. But I found some in Little Rock at their Whole Foods. Speaking of Little Rock, I also found Treeline cheese at their store. Another product Memphis WF doesn't carry. Come on, Whole Foods!! Get with it! For dinner one night, I made this snacky plate with Treeline Aged Cashew Cheese, Milton's Baked Everything Crackers, Hope Thai Coconut Curry Hummus (also from the LR Whole Foods), and Crudites. While we're on the subject of Arkansas, I'm proud to announce that my little hometown — Jonesboro — now has a pizza joint that carries vegan cheese!! It's called Uncle Maddio's, and they have Daiya!! I went home a couple weekends ago to visit my parents, and we went there. It's a build-your-own pizza joint, and I picked Daiya cheese, a garlic olive oil base, black and green olives, sundried tomatoes, and portabella mushrooms. Man, this was good. I can't wait to go back home and eat another one. Finally, I'll close with this. It's not food. But isn't this wine glass from the Little Rock Marathon the best? For now, I can drink wine up to the 13.1 mark (about 10 ounces), but hopefully, by the year's end, I can have the full glass! Alright, well, I'm off to Seattle! I'll share lots of pics when I return! Vegan Dessert That's Actually GOOD For You! Big Love for Love Bean! Vegan Potluck at Imagine Vegan Cafe!